From the critically acclaimed author of Amina’s Voice comes the second book in an exciting new middle grade series about a scrawny fourth-grader with big dreams of basketball stardom. Now that Zayd has made the Gold Team, he’s hustling hard and loving every minute of the season. But when team starts to struggle, Zayd can’t help wondering if it has something to do with him. Even worse, his best friend Adam suddenly starts acting like he doesn’t care about basketball anymore, even though they are finally teammates. He stops playing basketball with Zayd at recess and starts hanging out with other kids. Then, Adam up and quits the Gold Team to play football instead. While his uncle’s wedding preparations turn life into a circus at home, Zayd is left on his own to figure things out. He has to decide how to still be friends with Adam and step up to fill the empty shoes he left on the court. 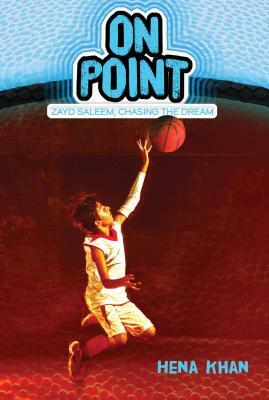 Does Zayd have what it takes to be on point and lead his team back to victory? "With just enough action to keep readers turning the pages and a sprinkle of age-appropriate realizations throughout, this small book is a great pick for elementary-age readers....A delightful follow-up from a writer who understands children, family, and culture." family. Readers will look forward to further adventures featuring Zayd."